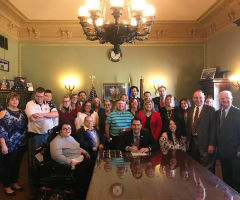 Disability Rights Wisconsin (DRW) celebrates the passage of three important bills for people with disabilities by the Wisconsin State Assembly and Senate and asks for the Governor to sign them into law. DRW celebrates the passage of the Supported Decision-Making bill (AB 655/SB 552). DRW has been a champion of supported decision-making as another tool for people with disabilities and older adults to use in their daily lives. This legislation will allow people with disabilities and older adults to formally designate others they want supporting them and gives the supporter a seat at the table when decisions are being made, allowing the individual to consult with their supporter when they need it. Supported decision-making creates a less restrictive alternative to guardianship that courts may consider before considering guardianship. “Wisconsin is one of the leaders on supported decision-making as only the third state in the nation to create such a statute,” stated Mitchell Hagopian, Attorney. The Partners with Business bill will help people with disabilities maintain jobs with natural supports in their employment and will help expand opportunities for people with disabilities to maintain steady employment. The legislation will also expand the Partners with Business to other parts of the state for people with disabilities. “People with disabilities can help address our workforce shortage in Wisconsin and this model can support businesses that want to hire people with disabilities and retain them as employees.,” stated Daniel Idzikowski, Executive Director. DRW thanks legislators in the Assembly and Senate for their support of people with disabilities in passing legislation that will help people with disabilities lead full, integrated lives in their communities.